The authors of Manual of Cultivated Conifers, published in 1965, claimed to have covered all the species of conifers that are hardy in the cold- and warm-temperate zones and also to have included all the names of cultivars published since 1753, with descriptions. The book at once established a claim to be the most complete survey of the cultivated conifers possible, a lead that it has held for nearly a quarter of a century and which, despite the appearance of other manuals, it can still claim because of its documentation of the names. A very large number of the older names in that book relate to selections that have long since been lost to cultivation. On the other hand, since 1965 there has been a great increase in the number of new cultivars. 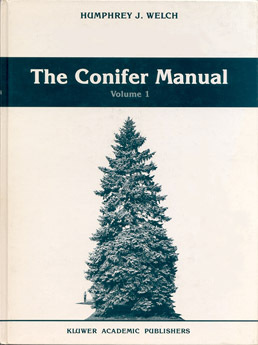 The present Conifer Manual takes account of both these matters and also incorporates changes in the taxonomy of conifers that have been accepted during this period. The opportunity has been taken to amplify the descriptions of species and to introduce a new system of guides to their identification which many readers will find easier to use than formal keys. A notable change since 1965 has been an increase in the use within ornamental horticulture of species that never attain arboreal proportions and of slow-growing variants of larger species. This has resulted in a proliferation of cultivars loosely embraced under the term 'Dwarf conifer'. These have been dealt with in depth in the present author's own books, notably in Manual of Dwarf Conifers, published in 1979. The incorporation of a complete up-date of that book within the present work will serve to justify the claim to comprehensive treatment that is implicit in the title The Conifer Manual.